This is a special hand made book by Tara Publications. 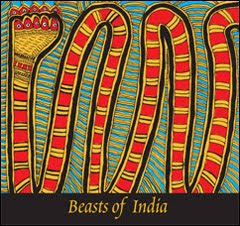 As the title suggests it is a collection of the Beasts of India as they appear in Indian folk and tribal art. The book is in three parts. “What is one to make of the mode of creation that is not concerned with the uniqueness of the art object or the artists vision? It takes its ‘aesthetic’ status for granted, is not anxious about straddling different disciplines, about influence or imitation, and is very matter-of fact about its powers to suspend disbelief. This goes against the commonly accepted western definition of what art is: a one of a kind object made by a fiercely individualistic individual, engaged in the expression of some kind of truth telling. The second part is the pictures of Indian animals. What I liked is the way the pictures are organized. Tigers in Rajasthan’s Pithora, MP’s Gond, Bihar’s Madhubani, Orissa’s Patachitra and Jharkhand’s Sohrai. Followed by the Lion, how the majestic animal is represented in different the regions, so on an so forth. It is easy to flip the book and compare the different styles. It is easy to draw conclusions. Even for a five year old it is obvious that the Gond is more intricate and detailed than the Pithora. A three year old can make observations that the Madhubani is partial to primary colors. Yes, I read it with my five year old and three year old and it appealed to them as well. The third part of the book is an index with the a thumbnail of the art and a blurb about the art work. Also the book comes with 5X5 cards of the a Madhubani snake, Gond deer, Pathachitra tiger and Pithora monkey. Definitely an asset to our bookshelf. More here to see how the book inspired us. Superb post utbt. Will look out for this book. Always feel like owning every book that Tara Books bring out. Recently took my kids to the Gandhi Shilp Bazaar where they sat down next to the artisans woking there. What a treat it was to watch them create magic - Madhubani drawings, Andhra leather puppets, Assamese canework, Chennapatna toys,.. Thanks Chox, Tara books are compelling. And you know what else is compelling? You. With all these details about Shilp Bazzar, Pratham, Hoo, Bookaroo....I am starting to wonder what I am doing in the US of A. Thanks Satish. 'Everyone know what a dragon looks like' is on hold. I am sure the girls will enjoy it. 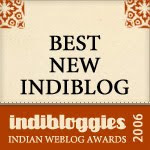 And, India awaits you. Come soon. Wonderful post UTBT. I liked your specifics on how the books can appeal to the very young. Urges me to read such books to my very own. Thanks. Wonderful pick and very well written review utbt ! I am now in a phase where anything about the various arts of India fascinates me. Like Chox,I also visited the recent Shilp Bazaar with the kids. I bought a Madhubani painting for myself (the family of artists were sitting and doing it there, so the kids got to see them in work !). I had told Sooraj that he could pick up any piece of art from the stalls. He loved an embossed Orissa painting and we got that too. There was a Dashavataram painting hanging in the Orissa stall and we causally asked them how they did that. The artist immediately started demonstrating right there. It was so cool :-). Ranjani: We have a Katha book in which all the illustrations are done in Madhubani style. Sooraj would love it. Meera, doesn't this make a strong point for us to meet up when you are in our part of the woods? Two words for you - Book exchange. Ranjani thanks. So I am sure I am going to dream about Shilp bazzar tonight. Love this, utbt, something I'd enjoy. Thanks! how come i never find these treasures during my landmark/odyssey trips?! Thanks for the link Oliver.